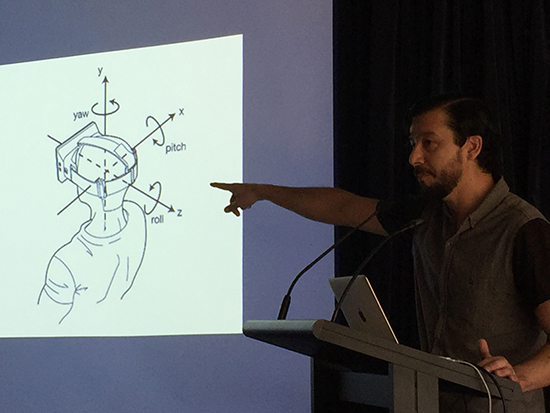 Oscar Raby, AIDC/ Film Victoria VR Workshop, ‘Making Virtual a Practical Reality’, which ran in conjunction with AIDC 2017’s VR Plus Day program. The computer game WarBirds may not sound like the most promising conduit for a revelatory experience. The game offers players the chance to participate in World War II air combat missions with a startling degree of realism. I’ve never been much of a gamer, but it was through playing WarBirds that I began to grasp just how tricky it is to fly an aeroplane. When machine guns began rattling in my ears and I fell out of the sky, I also began to sense how terrifying it must have been to have actually faced death with no more than a few dozen hours of flying experience. In other words, I began to understand—in a small way—an historical moment through a simulated experience of its conditions. Cut to November last year. I’m donning a headset in a gallery at the Australian Centre for the Moving Image, to experience Lynette Wallworth’s virtual reality work Collisions. Seconds later I’m atop a ute, traversing the land of Indigenous elder Nyarri Nyarri Morgan and the Martu tribe in Australia’s red centre with sand, scrub and sky stretching in every direction. All my senses tell me I am there—or rather here—in the desert, experiencing this environment. It’s overwhelming, thrilling and a little scary. When I emerge 18 minutes later, I feel like the audience at the Grand Café, 1895 after the Lumière brothers screened their films publicly for the first time—as if I have witnessed the birth of a whole new mode of mediated perception. These two encounters late last year opened my eyes to the embodied, empathetic possibilities of virtual reality for documentary practice. 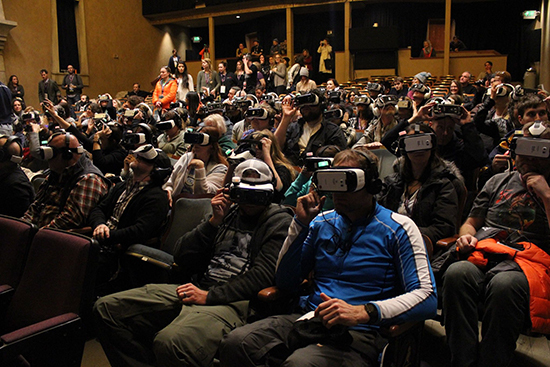 The organisers of this year’s Australian International Documentary Conference evidently share my enthusiasm, for the event opened with a special VR+ Day dedicated to presentations from some of the leading VR practitioners working in the documentary field. Iranian-Canadian Navid Khonsari has been a games developer for the past 17 years, including work on the notorious Grand Theft Auto III, a third-person shooter game that aroused intense controversy for its violence. More recently, Khonsari has been exploring quite different terrain, with the founding of his own company, iNK Stories, and the creation of what he calls “vérité games” that put players directly inside carefully researched historical situations recreated using virtual reality. The emphasis is on experience, not achieving an objective. 1979 Revolution: Black Friday is iNK Stories’ first VR work, set amid the Iranian uprising that overthrew the dictatorial regime of the Shah. “Human experience is never black and white,” Khonsari told the AIDC audience, the development of 1979 Revolution being informed by a desire to bring to life an historical moment that has been reduced to a one-dimensional descriptor—the Islamic Revolution. Players inhabit the streets of Tehran through Reza, a young Iranian photographer who is forced to make various decisions as he witnesses the revolution unfold. Each choice sets the narrative—and the player’s experience—off in a different direction. Indecision also has consequences: if choices are not made within a certain time, events continue to unfold regardless. Khonsari detailed the historical research that informed the creation of the work, noting that the presence of French photojournalist Michel Setboun in Tehran during the uprising inspired the decision to base the game around a photographer. Setboun’s images are also recreated in the game’s action. Extensive interviews were carried out with witnesses and experts from a range of backgrounds, to ensure the viewpoints of all the diverse political factions that participated in these events were represented. “Documentary makers are already doing 80% of the work required to do virtual reality projects in their existing historical films,” Khonsari explained. Other speakers at VR+ Day discussed projects based around guided narratives set in immersive environments, rather than a choice-based gaming model. All, however, echoed Khonsari’s emphasis on existing documentary practices. Local artist Lynette Wallworth, along with Oscar Raby and Katy Morrison of the Melbourne-based VRTOV virtual reality production studio, stressed the ongoing importance of story, even in a medium that so radically redefines the experience of moving images. 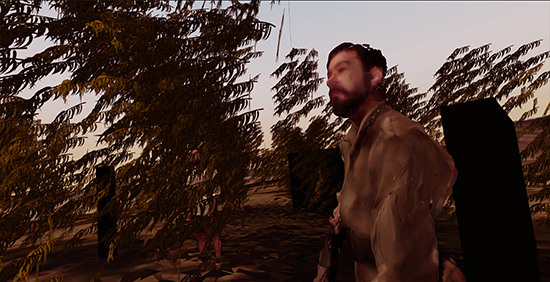 Raby, for example, was inspired to create his VR documentary Assent by a tale his father told of his time as an army officer in Chile, 1973. Raby’s dad witnessed a massacre of civilians by fellow soldiers during the brutal military coup that brought down the leftist government of Salvador Allende. Part of Raby’s motivation for immersing users in that time and place, he explained, was to understand what it is to be witness to horrific events over which you have very little control. While all speakers expressed enthusiasm for the experiential potential of VR, several also sounded a warning about the medium’s highly manipulative nature. VRTOV’s Katy Morrison noted how VR taps into different parts of the brain from those involved in viewing conventional moving images, generating an embodied experience that leaves a deep emotional memory, no matter how critically we try to approach the medium or its content. What are the ethical implications of recreating an embodied experience of intense trauma, she asked. Or of placing users in a situation likely to elicit intense feelings of hatred? Ethical debates that have long been part of documentary practice look set to be reignited with a vengeance by VR. What is the state of play vis-à-vis funding for documentary practitioners wishing to explore the VR storytelling frontier? Melanie Horkan, a Canadian producer currently developing a VR project with iNK, noted that the involvement of Telcos in the Canadian funding landscape has proven invaluable in terms of support for the new field (see RealTime 66 for an earlier discussion of Canada’s unique, innovative funding structures for interactive works). Local speakers agreed that Screen Australia and the state film agencies have shown a keen interest in supporting VR, but also pointed out the difficulty of working within existing funding structures built around traditional film development models. Prototyping, for example, was emphasised by all speakers as essential for the success of VR projects. A 360-degree virtual environment makes it impossible to predict exactly how audiences will respond to and interact with the work, therefore monitored experiences of early iterations of each project are essential. Dedicated prototyping funding, however, is currently lacking in Australia. “It’s still a film development model, with an emphasis on script development,” Katy Morrison commented. Nonetheless, Australian practitioners like Morrison and Raby, along with artists such as Wallworth, are at the very forefront of documentary’s incursion into the virtual reality field. The technology’s potential is both thrilling and daunting, with its ability to engender profoundly empathetic experiences and to whip up intense emotions of a more negative kind. As headsets become cheaper and more standardised and VR likely moves out of the gallery and into our living rooms, the question of how the medium will be deployed is very much a work in progress, the ethical and philosophical questions VR poses barely touched. AIDC is to be congratulated for offering a very early roadmap for local practitioners wanting to explore this exciting new world—and to forge ahead into unexplored realms.